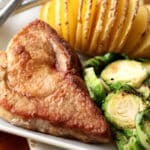 These incredibly simple pork chops blew my mind. You know those meals that you make and even though you are the one who cooked everything, you still can’t believe it came out of your kitchen? That’s how I felt the first time I tasted pork chops cooked on the stove top. In all honesty, I have never been a big fan of pork chops. In my experience, pork chops are typically dry, tough or bland and they simply don’t interest me. THESE pork chops? I’d put them up next to a great steak any day of the week. The pork chops were juicy, tender and flavorful and the whole family gave this meal two thumbs up! I served them with Hasselback Potatoes and Smoky Buttery Brussels Sprouts. It was a great dinner that took well under an hour to put together, even with baking the potatoes. When cooking ANY meat on the stove top, time and temperature are the two most important factors. 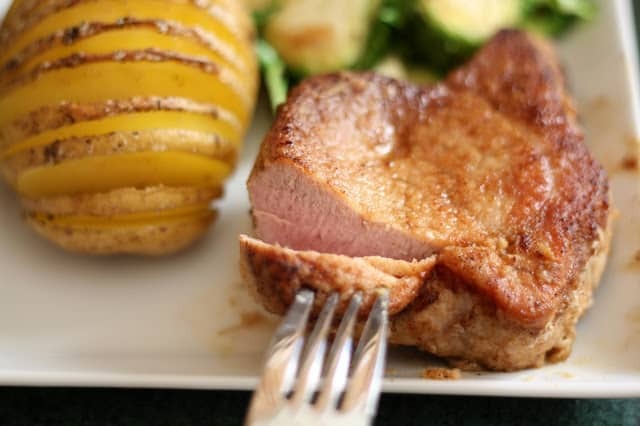 My only word of caution is to be very careful not to overcook the pork chops.It took me just 3 minutes on each side to brown and cook each 1″ thick pork chop. The first time I cooked pork chops this way in a stove top skillet, I cut one of the chops too thin and as a result, it cooked about a minute too long, compared to the rest of the others. The resulting taste and flavor made my error obvious. Don’t get me wrong. It was still good (this method is forgiving like that), but not nearly as amazing. To help you out with finding the best cooking time and temperature, I put together a handy guide for cooking pork here. I frequently buy sirloin tip pork roasts. They are inexpensive and I always have at least a couple small roasts in the freezer. I roast them in the oven or in the crock-pot at least once a month. This time, I decided to slice the roast into thick chops and try it in the skillet. The result was incredible and so easy that I know I’ll be making them over and over again, especially when I’m in a hurry to get a meal on the table. If you are buying chops for this recipe, look for at least 3/4″-1″ thick chops. I highly suggest just buying a roast and cutting them yourself. It was very simple and so much less expensive than the thick-cut chops in the store! 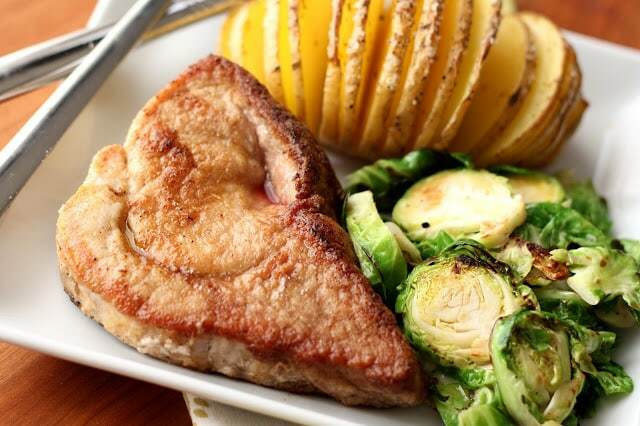 Cooking pork chops in a skillet brings out such a wonderful flavor in the meat. It results in a tender, juicy chop that’s far from the tough texture and bland taste I used to associate with pork chops. This recipe turns out well every single time and, best of all, is so easy that anyone can do it. Pork chops are first dredged in a lightly spiced batter then cooked in melted butter in the skillet. They’re left alone for a couple of minutes to brown before being flipped and cooked on the other side. A touch of cayenne pepper mixed with the flour adds just the right amount of heat to complement the tender, savory meat. The first time I made these pork chops, I used brown rice flour to coat these pork chops which just happened to make this a gluten-free recipe. If you don’t have brown rice flour around or aren’t worried about cooking without gluten you can easily sub regular all-purpose flour with good results. These fuss-free pork chops are wonderful to serve exactly as they are. Over the years, I’ve also made many variations on the recipe that I love just as much. 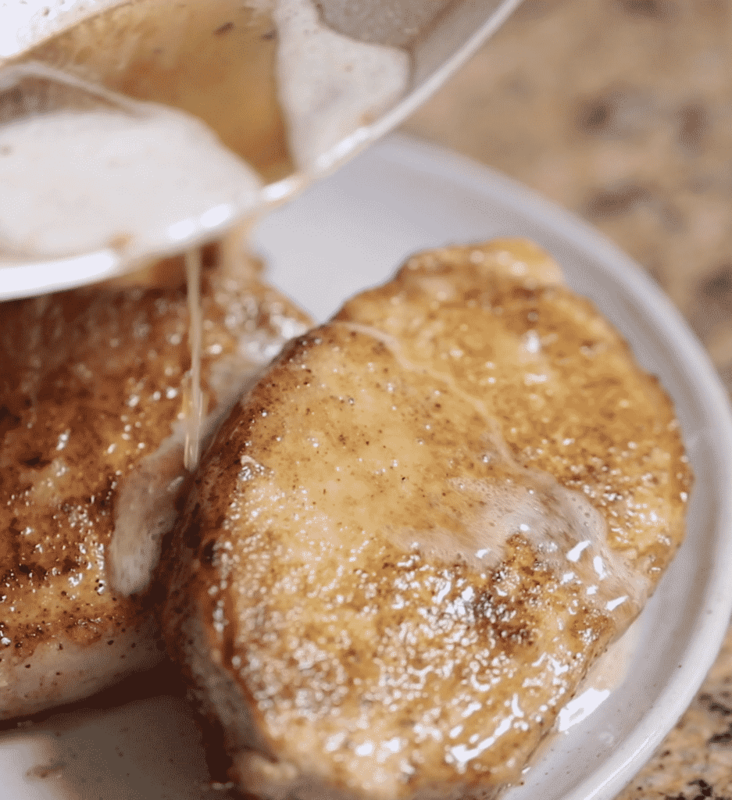 Balsamic Dijon Pork Chops use the skillet cooked method with the addition of a tangy, sweet glaze. 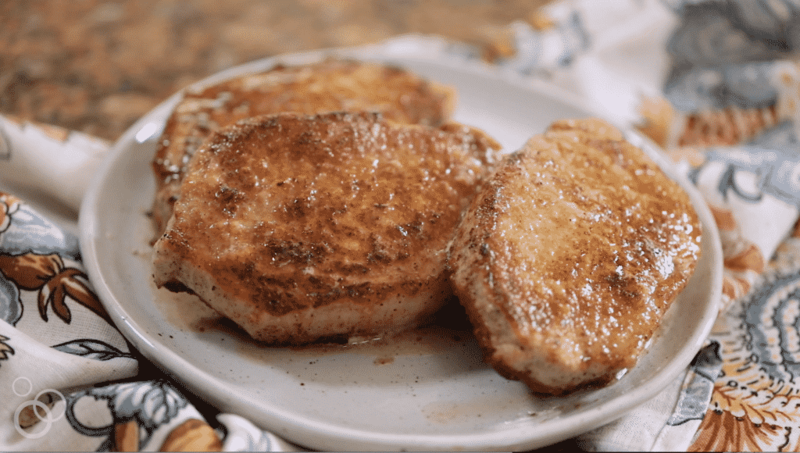 I can’t get enough of the flavor match made in heaven that is balsamic vinegar and dijon mustard and these pork chops are one of my favorite ways to enjoy it. If you’re not in the mood for pork chops, there are so many other wonderful ways to use those roasts in the freezer as well. Spiced Apple Butter Pork Roast is an easy, flavorful meal that my whole family loves. It’s worth making a big batch of Crock-Pot Apple Butter for that recipe alone. Another stove top pork recipe I love is Pan Fried Pork Medallions. Pork tenderloin is skillet fried and served with a decadent creamy wine sauce. 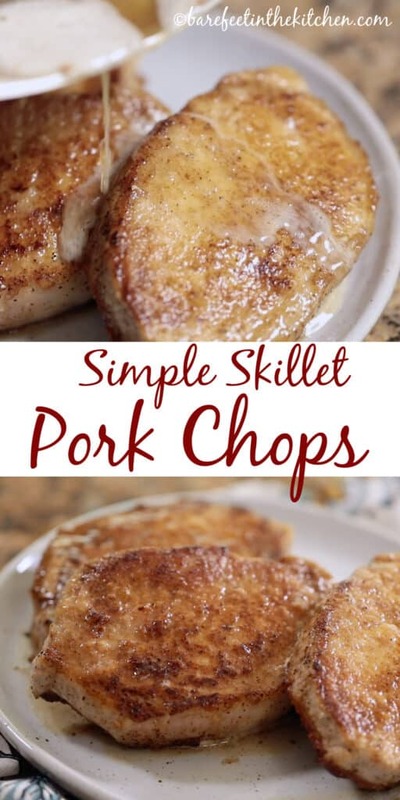 While there are so many ways to cook pork chops from the slow cooker to the Instant Pot to the oven, Simple Skillet Pork Chops are still my personal favorite. Stir together the flour and all the spices in a shallow dish. 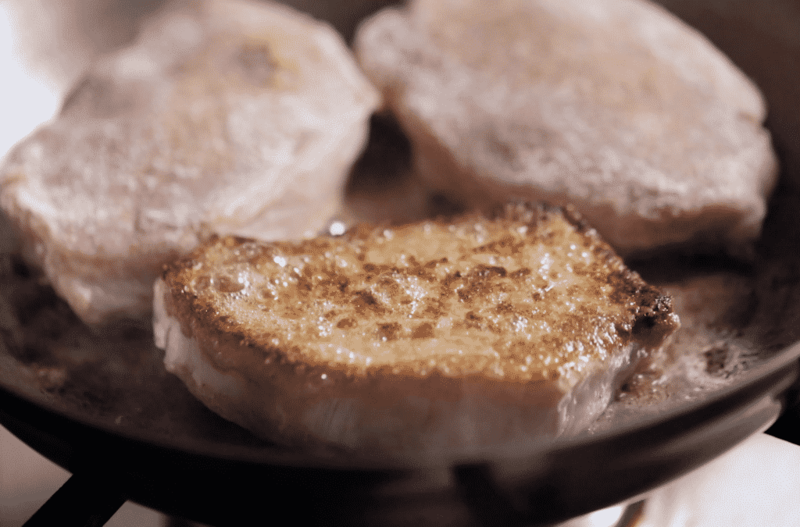 Melt 1 tablespoon butter in a skillet over medium-high heat. Let it foam and then brown slightly. Swirl the butter to coat the pan. Dredge each pork chop through the flour mixture on all sides and then place 2-3 chops in the hot skillet. Let them cook undisturbed on each side, turning only once. They should be golden brown. Remove from the pan and add the second tablespoon of butter to the skillet and the remaining pork chops. Repeat the cooking method above. Let the meat rest for a few minutes prior to slicing. You may have caught that I mentioned Butcher Box in the video for this recipe. Are you wondering what I’m talking about? Butcher Box is a subscription meat delivery service and I’ve been impressed with the quality of the meats they’ve delivered. I partnered with Butcher Box towards the end of last year with a plan to sample their meats and potentially share them with you here. I’ve waited a few months to give you the full scoop because I wanted to make sure that the quality remained reliable and consistent. I’m happy to tell you that this is some of the best meats we’ve ever bought. When you sign up for Butcher Box, you’re given several options to customize your box of meat. Beef and Pork, Beef and Chicken, Pork and Chicken, all Pork, all Beef, you get the idea – and you decide what will best suit your family’s needs. Is Butcher Box A Good Deal? Now this is where I’m going to be very honest and tell you that for the quantity of food that my family consumes, I’ve avoided including any of the chicken options in our deliveries so far. The larger beef and pork roasts, steaks and pork chops, are simply the best deal when figuring the cost of the box (see my explanation in the above video). Choose your delivery (and be certain to check to see if there is a free gift available when you sign up!). If you use my referral link HERE: you’ll get free bacon AND $40 off your first two boxes! These pork chops are juicy, flavorful, and a must if you own a searing skillet. Stir together the flour and all the spices in a shallow dish. Melt 1 tablespoon butter in a skillet over medium high heat. Let it foam and then brown slightly. Swirl the butter to coat the pan. Dredge each pork chop through the flour mixture on all sides and then place 2-3 chops in the hot skillet. Let them cook undisturbed on each side, turning only once. They should be golden brown. Remove from the pan and add the second tablespoon of butter to the skillet and then remaining pork chops. Repeat the cooking method above. Let the meat rest for a few minutes prior to slicing. Enjoy! 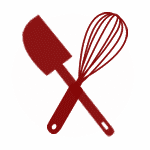 Disclosure: Barefeet In The Kitchen is a Butcher Box affiliate and will receive a small percentage of any purchases made through the links in this post. Thank you for supporting the brands that help make Barefeet In The Kitchen possible. As always, all thoughts and opinions are my own. My mom used to occasionally make pork chops but they were always terribly dry! I'll have to share your version with her. My mom used to cook pork chops to death - even though they were already dead. I guess that was back in the day of "don't undercook your pork!" I love your tips about buying the roast and slicing it yourself. This sounds great and the whole meal looks fantastic. I still haven't made those potatoes - gotta get with the program! I love everything on that dinner plate. My mom cooked pork chops all the time, and I do remember them being dry, too. You are my meat guru, so I'll try these. And those potatoes? I'm heading there now. Like pan fried fish, it's hard to beat a pan fried pork chop and yours looks delicious. Like others have said, my mom cooked them until the fat was actually crispy - they could have been used as weapons and the fat was the best part. In our moms defense, Trichinosis was alive and well in their day and they just cooked as they had been taught to keep as safe. My mouth is watering at the sight of your scrumptious looking dinner dish, everything looks fantastic! I am so right there with you on steaks vs pork chops. When done right, they are equally good.